Harpist Patti Hood, who makes a guest appearance on the new GUNS N' ROSES album "Chinese Democracy" (on the track "This I Love"), was recently interviewed by the GNRSource.com web site. You can now download the chat as an MP3 audio file at this location. 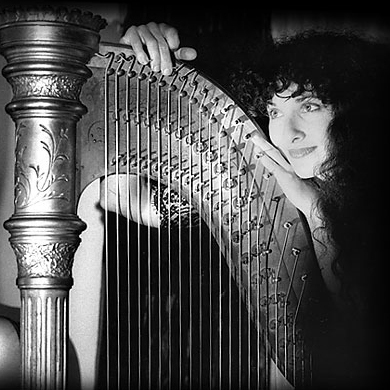 Patti has recorded with YES lead vocalist Jon Anderson and recorded and performed with past and current members of TOOL and GUNS N' ROSES, but it is her volunteer work doing harp therapy that is most fulfilling for her. She has studied concert pedal-harp for ten years and studied vocals for thirteen years. She has also performed at numerous weddings, receptions, parties, brunches, openings, clubs, funerals, etc. She performs Irish ballads, folk songs, pop songs, and meditative instrumentals.